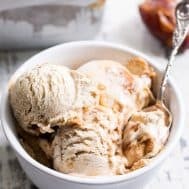 This salted caramel ice cream is easy to make, dairy-free, paleo, vegan, healthy, and so incredibly tasty! 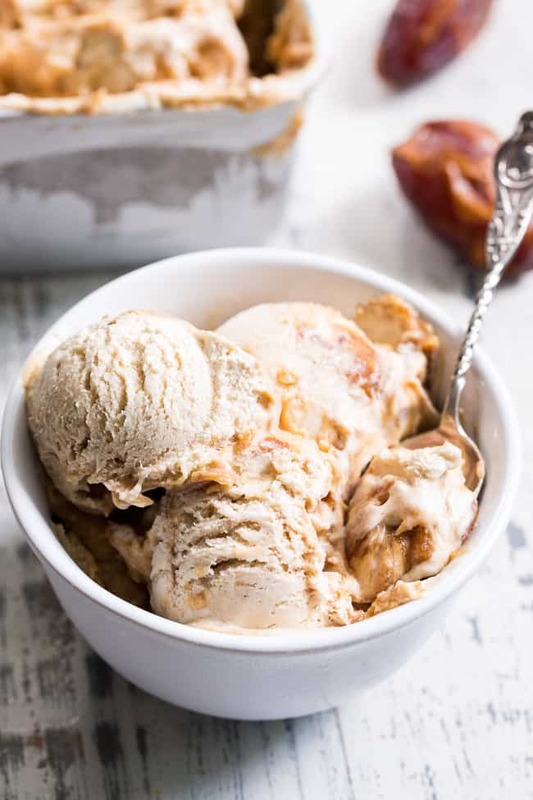 A simple vegan salted caramel made from dates is swirled into a cashew-coconut based homemade ice cream that’s creamy right out of the freezer. Add it to your list of must-try healthy ice cream recipes ASAP! 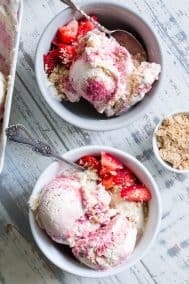 After making my strawberry cheesecake ice cream recently, I KNEW I had to test out another cashew/coconut ice cream base. This time, I wanted the cashews to only serve the purpose of texture and not actually mimic cheesecake, though. I had my heart set on a specific flavor, and luckily, an Instagram poll showed that you all are very into it too – salted caramel, of course! For about 2 minutes I contemplated whether I wanted to create the salted caramel by blending dates, or by cooking coconut milk to a syrup. And THEN I remembered this – dates are awesome in ice cream, period. The reason for this is that they just don’t freeze! Or rather, date caramel doesn’t freeze. I haven’t actually tried to freeze whole dates (and probably won’t ever attempt to) so I can only speak for the caramel/puree. It’s a healthy homemade ice cream maker’s dream – seriously. Side note – I actually discovered this odd no-freeze phenomenon after making my caramel turtle candies and sticking the leftover caramel in the freezer. It never froze – so funny! Anyway, any of you who’ve made your own coconut milk ice cream know that it can turn rock solid in the freezer and require, like, 45 minutes on the countertop to thaw out. Not for the impulsive at heart! 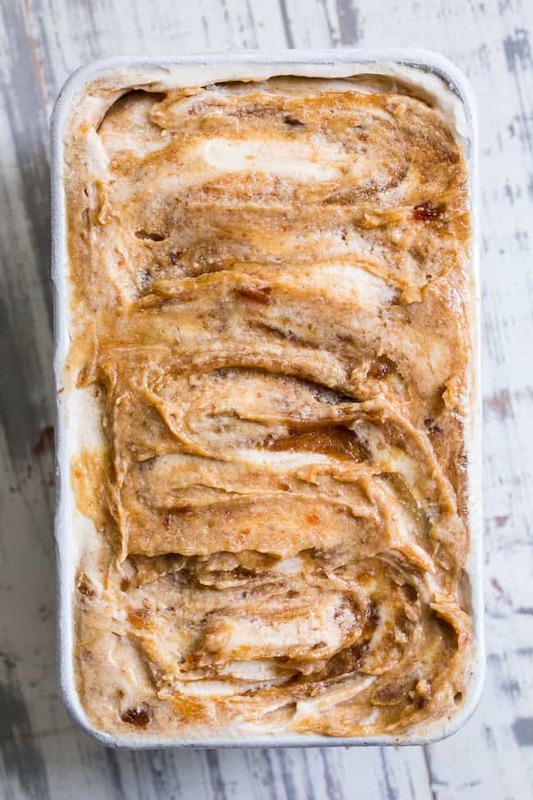 Since the date caramel is so helpful in the way of giving us the opportunity to be impulsive with our ice cream devouring, I decided to not only use it to swirl into the ice cream, but also to sweeten the base itself. Between the date caramel and pure maple syrup, the base might just be my favorite I’ve made yet! Although my date-sweetened vanilla bean MIGHT just be the winner there – it’s pretty amazing. And now I’m off topic. Back to the caramel! The caramel itself is super easy to prepare – you use softened medjool dates blended up with either non-dairy milk (I used almond) or water along with vanilla extract and sea salt and BOOM! You get the deliciousness you see below. I have both a Vitamix blender and a Kitchnaid Food Processor, and I prefer using the food processor to puree the caramel and the blender to puree the ice cream base. This seems to work for the appliances I have, although you can likely use either/or for both and be just fine. Since you’ll need some of the caramel to add into the ice cream base, make sure you make it first! Once both are prepped, you’ll need to churn your ice cream base (without the caramel) using an ice cream maker. I think we’re ready to start – who’s with me?! 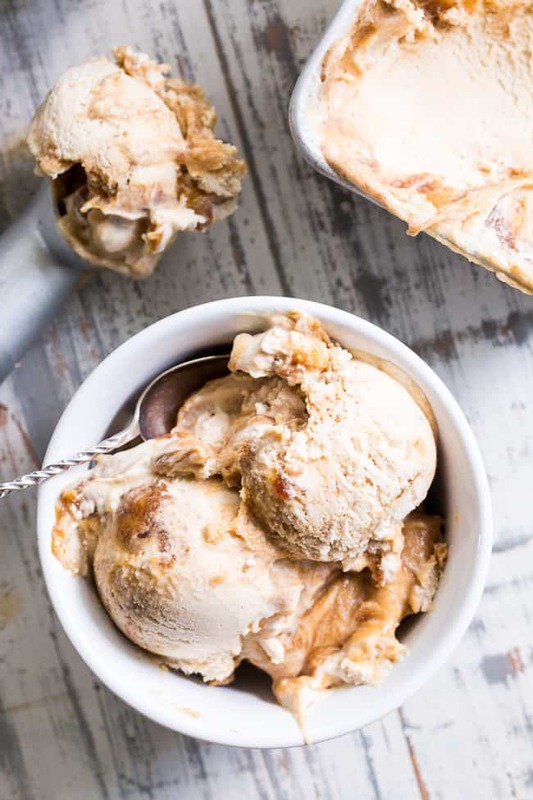 Let’s get those dates soaked and make the creamiest dreamiest salted caramel ice cream ever – go time! 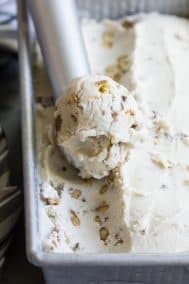 This salted caramel ice cream is easy to make, dairy-free, paleo, vegan, healthy, and so incredibly tasty! 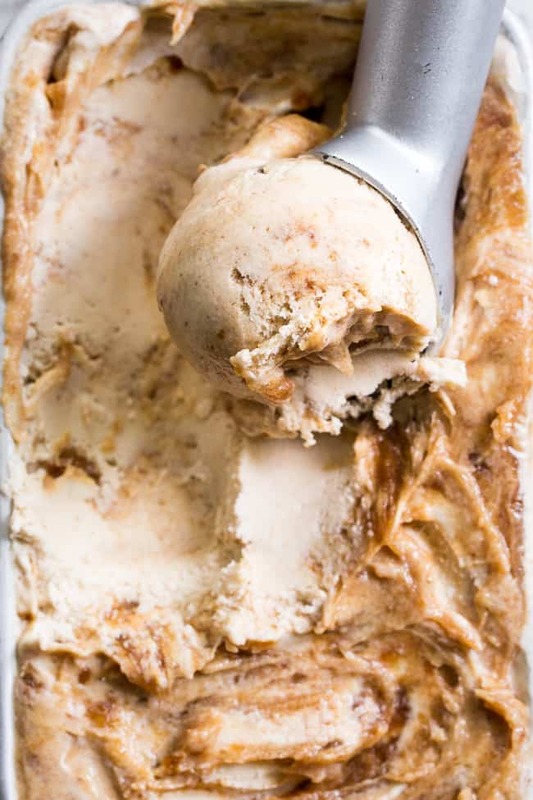 A simple vegan salted caramel made from dates is swirled into a cashew-coconut based homemade ice cream that's creamy right out of the freezer. 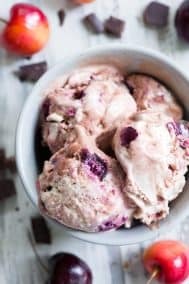 Add it to your list of must-try healthy ice cream recipes ASAP! Place the softened dates, 4 Tbsp almond milk or water, and vanilla in the food processor/blender and blend or process until very smooth, stopping to scrape the sides as needed. If mixture if very thick, add the additional Tbsps milk or water to thin. Continue to process until the mixture resembles caramel, then stir in the salt. Place in the freezer until ready to use. Make sure the bowl for your ice cream maker has been in the back of the freezer for at least 2 days. In a high speed blender or food processor (I used my Vitamix for this step) blend the soaked cashews, coconut milk, maple syrup, 1/4 cup of the prepared date caramel, and vanilla. Continue to blend until mixture looks like a smoothie. Once totally blended, you can chill in the fridge until ready to churn, or churn right from here. Once churned, you’re ready to put it all together! Add half of the ice cream mixture to a (cold) small loaf pan or other freezer safe container. 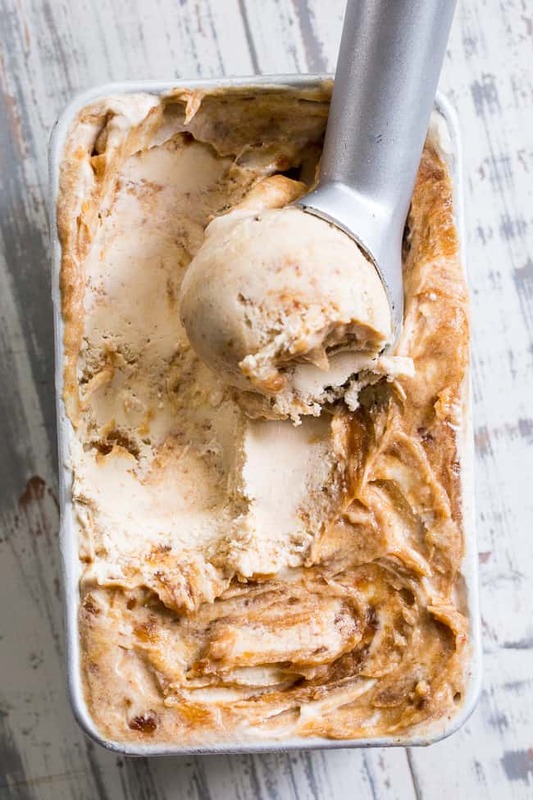 Using a spoon, dollop half the remaining date caramel over the ice cream and swirl in using the spoon or a knife. Add the rest of the ice cream over the top, then repeat the process with the remaining caramel. Smooth the top and cover tightly with plastic wrap before placing in the freezer. Freeze at least 3-4 hours before serving. You can also freeze overnight. Due to the dates, the ice cream should be scoop able and creamy right out of the freezer! If it hardens too much, thaw on the countertop for 10 minutes before scooping. Enjoy! 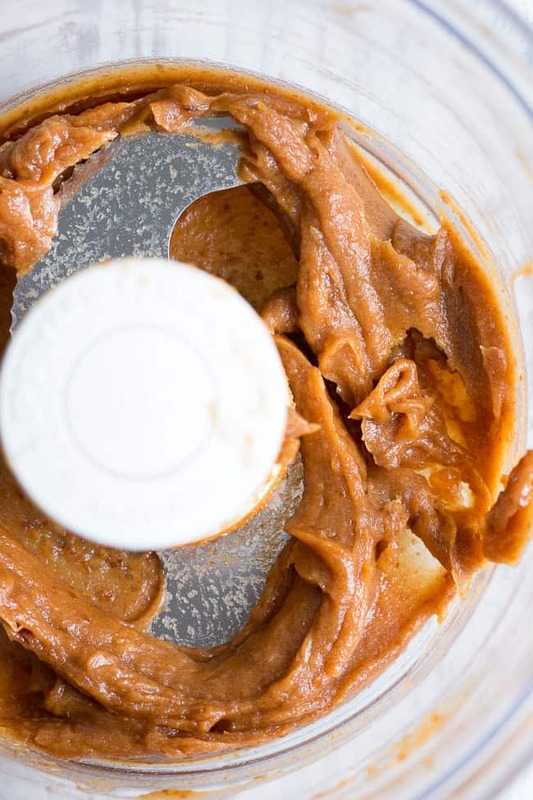 **I recommend making the caramel in a food processor for best results, however, a high speed blender can work as well, but may need more liquid. ***For a NUT FREE version, sub in 1 cup coconut cream, or the thick part only of a 15 oz can coconut milk, for the cashews. I love salted caramel! This ice cream looks delicious and perfect for the summer! I’m so thrilled to hear you’re enjoying everything! I am so going to make this! Love your blog/recipes! Mine turned out to textutred from the cashews. I’m certain it was a blending issue. I’ll try the all coconut milk version next. The “caramel” sauce is delicious!!! 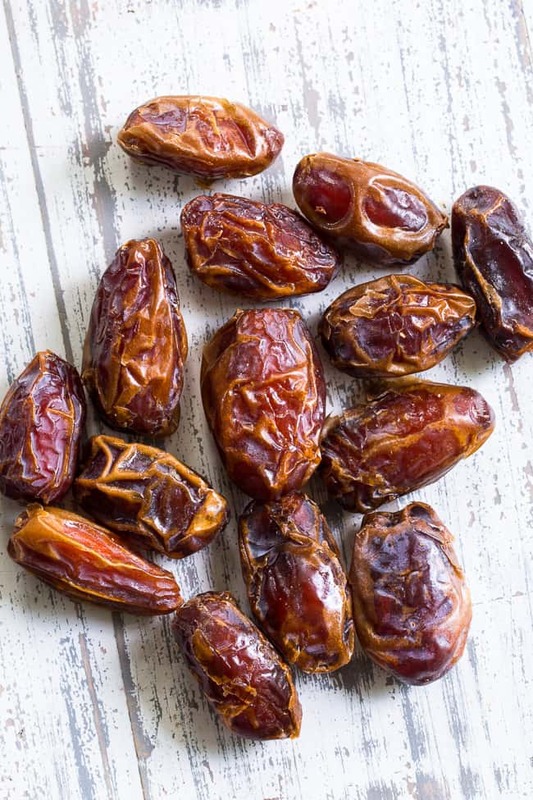 Unfortunately i cannot have dates (or dried fruit), i’d love to try this. is there anything you recommend to replace the dates? coconut sugar?